The Institutional Advisory Council (IAC) began as the National Coalition of Burn Center Hospitals (NCBCH) and has evolved to be an integral component of the ABA committee structure. Effective private and public-sector advocacy with Congress, key agencies such as CMS, and private payer organizations. Effective advocacy to counteract potential cuts to Medicare and Medicaid, eliminate annual and lifetime limits on insurance, eliminate the 24-month waiting period for Medicare eligibility for disabling burn injuries and DRG changes that impacted burn care procedures. Representation for burn surgeons on the AMA Relative Value Update Committee and through participation in the CPT update and review process. A formal voice within the ABA through designated representatives on key ABA committees, to ensure that the burn center perspective on important issues is heard. A special educational forum at the ABA Annual Meeting. Direct access to participate in the ABA’s National Leadership Conference and present issues that are relevant to the specialty directly to legislators and congress members. 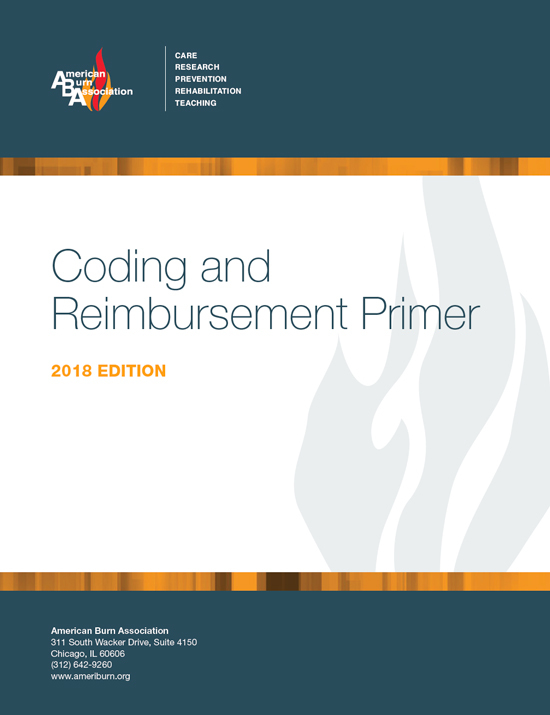 The 2018 ABA Coding & Reimbursement Primer is now available and complimentary to IAC members. This publication provides information to enhance documentation and coding for the care of patients treated in burn center hospitals. Is your burn center interested in joining as an Institutional Advisory Council member?